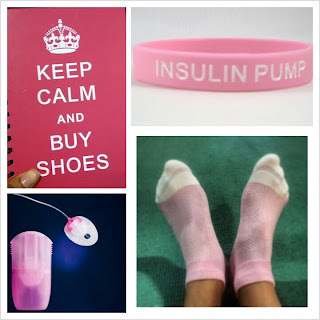 Pink is the Colour of Pump Success | Life, Sport and Diabetes - An everyday look at my life with type 1 diabetes. If you've read my previous blog about going onto an insulin pump, you'll know that I didn't feel like I had many choices available to me other than getting a pump at the time. Primarily because I was becoming insulin resistant, my blood sugars were miss-behaving and were constantly high and the Metformin tablets I was on could not be viewed as a long term solution. 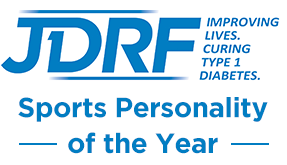 So whilst I was offered the opportunity to have one, and whilst I appreciated the opportunity- I felt it was a necessity in order to manage my diabetes care going forward. So I was to be put onto an insulin pump, I was to be told when to do my blood sugars, what to eat and how much insulin to give. And as a result of which felt very over-whelmed by the decisions that were being made for me. An insulin pump is a mobile phone sized device that delivers insulin through a tube and needle that are attached to you 24 hours a day. The insulin is administered every 3 minutes and only in emergency situations are injections required. It might sound silly but I was a little disappointed when I was given a black insulin pump. I should mention that whilst I was grateful for it, the only choice I felt I'd been given throughout the whole ordeal was what colour insulin pump I could have. I asked if I could have a pink one. So when the black one arrived I held back the disappointment and got on with learning about how to use it. But what the medical team didn't understand was that the insulin pump was to become almost like an extra body part. And in order to feel comfortable with it and get along with accepting it was part of me. Taking away the opportunity to choose the colour was not helpful. For people who do not have an insulin pump, the only way I can liken the feeling is that if you imagine that because you'd burnt your head someone said you had to wear a hat. And this hat was not a stylish one, it was an ugly black one that you had to wear all day everyday. That people asked questions about and gave odd looks too. But despite feeling uncomfortable you had to keep wearing this 'hat' for health reasons. How would it make you feel? But perhaps being given the black pump was a blessing in disguise because this particular type of pump didn't work for me. The sets (needles) were the wrong angle so constantly caused no delivery notifications (where the needle gets blocked and insulin cannot be delivered so blood sugars rise quickly), to pop up and it wasn't water-proof so when I finally did get back to training I was paranoid about breaking it. Through fortuitous circumstances however, I found out that you didn't always have to have the insulin pump that your health board had a contract with- if the pump you were on was causing problems. And what was even better was that these other pumps were water-proof and they had needles that could be positioned at 30 degrees into the skin opposed to 90 like the other. So they wouldn't kink when I sat down. It was also water-proof so I could get back to training and not have to worry about how I might break the pump whilst running outdoors. But most of all this new pump came in pink. The applicator that you use to put the needle in, came in pink and the end of the tube that connected to your body came in pink. And as soon as I started using this new pump, not only did I start feeling better physically because I had less no delivery notifications from the pump but I felt better in my mind too. It was then started to accept that if I was going to be connected to a machine for the foreseeable future, it had now started to feel like an extension of me. Opposed to an ugly black thing that followed me round all the time. Finally having that one small decision of what colour pump to have- that I could make by myself did wonders for my self-confidence. So for me pink in those early days became the colour of pumping. A couple of years ago I made the decision to go onto a black insulin pump. The pump rep that I usually dealt with nearly fell off his chair as he'd been so used to me nagging him about pink accessories. But this decision marked a milestone in my diabetes journey, because choosing a black pump meant that I had finally accepted being on a pump. It didn't matter anymore what colour it was because I was pleased to have one and finally thought of it as an extra limb or another part of me. Anyone who sees me at the athletics track knows that pink and black have become my colours. Whether it's my training essentials such as my Protect it socks (in pink) or my training leggings (in black) this colour scheme seems to follow. I especially love my pink protect it socks because when you're competing and want to be taken seriously. Not only do I get the added benefits of superbly comfortable and cool feet, I get the choice of colour to match my spikes. With the heat we've been having in Britain they've been an easy choice to make for every training session.